Last week, I told you about free, printable party invitations, perfect for a scaled-back, recession-style soiree. 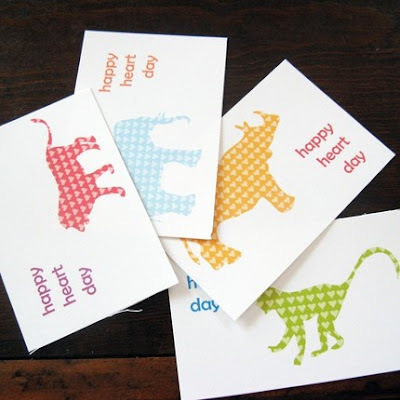 This week, I found these adorable, "school style" Valentines at Up Up Creative's Etsy shop (via the sublime Design Mom). For $5.00, you can download the template for these sweet Valentine greetings and print as many as you like! The mod mammal motif is clean, cute and classy. And the price is right when you need to produce dozens of Valentines for schoolmates, teachers, grandparents and babysitters. But get printing, Mamas! Valentine's Day is right around the corner! How cute are those cards!! I used to love art at school, but was never very good at it, but I really enjoy that creative element! With Valentines Day fast approaching, I guess this would be the perfect time to try and be experiment with crafts! I have also discovered an alternative way than buying cards in shops (if like me, you art skills look like a two year olds efforts) then this could be a solution! This all down to my lovely friend Alice. She sent me an e-Card for Christmas, (she was in New Zealand over the festive season) and I thought it was such a cool way to send greetings, I have now been converted!I have trawled the internet and have found some really cool sites, but my fav one so far is called http://www.ecards.co.uk I found it really easy to use and the best thing is that it's free! Lots of different themes of cards to choose from, and lots of funny, and cute ones too. There is a great application where you can load your own photos and add them to the card. (This is called Face It) I put one of my mum in there and sent it to her, he said it made her smile. You can load different photos of your friends into different cartoon characters! My favorite one is the cartoon of Elvis dancing! Love, Hugs and Peace, Nicole.